Today was my big day at the rodeo. Mom, Dad, Pappy, Gran C, Patty and Floyd all went with me to the National Western Stock Show in downtown Denver. The weather was in the 60’s and it was perfect outside. There were lots of different events in the rodeo, but I had Mom take pictures of some of my favorites. I hope you enjoy them. The first event was full of cowboys on grumpy horses. These horses should seriously consider taking a nap during the day. I think they’d feel so much better. Here are the fancy draft horses. The big guys on the right weigh over 2,000lbs. each and were all decked out in fancy jewelry. 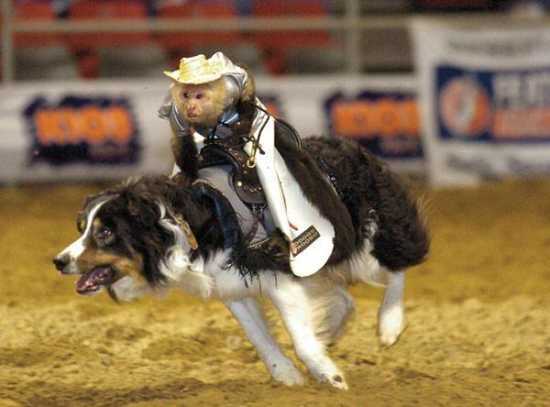 Next, a team of sheep herding, cowboy monkeys came into the ring. They were riding puppies like they were horses, which made me crack up laughing. Dad loves monkeys and I love puppies, so it was a big hit for both of us. The last event of the day was the bull riding. These bulls were crazy. I think they must have mad cow disease or something, because nobody is this wild. It was a lot of fun to watch, but it’s pretty dangerous for the guys riding the bulls. Some poor cowboy got stepped on and wound up with a broken arm. I hope he gets better soon. I also enjoyed the rodeo clowns. They were really silly and seemed to have a lot of fun. After the rodeo, I got a chance to personally meet some fuzzy farm animals. Mom had some yummy food that she bought to share with them. Unfortunately, some crazy goat jumped up on her and ate it all as soon as we got inside. Oh well, no big deal. I just used my charming personality to get to know these guys. As it turns out, they had all herd (no pun intended) about my blog and wanted to get a picture with me. I promised them I’d post it on my site. Check them out. This guy was my favorite. He had soft fur and really knew how to pull off that “just got out of bed” look. It was a really great day and you can bet I’ll be back again next year. I hope you enjoy the pictures. Mom did a great job. My plans are still up in the air for next weekend, but if all works out, I’ll have another exciting weekend to share with you. Stay tuned! It’s that time of year again. The National Western Stock Show is back in town for a few weeks. We’re going this weekend. If you’ve never heard of it, there’s a bunch of big animals, good food, funny clowns and plenty of great entertainment, the only downside is that it stinks. I mean it literally stinks. All those animals, means lots of animal poo. Those big bulls could really use some manners. I feel that if I have to wear a diaper, then they should have to wear a diaper. I just don’t want to be the baby that has to change it. Anyway, I’m excited. We went last year, but I was only a few weeks old and slept through most of it. Pappy showed me his pictures when we got home and I knew I had missed out. I really hope I don’t fall asleep this year. He sent me some pictures to share with you guys.